Can you imagine a simple Christmas present turning into a worldwide business? Neither did Nathan Clark when he gifted his wife with a candy thermometer. Nathan explained how that happened. "It all started by accident. Several years back I didn't know what to get my wife for Christmas. I heard this person on NPR talking about that candy is not really so bad for you. I was so-o-o happy to hear that. I eat a lot of candy. They said if you eat a pie you’re full but if you eat candy it’s so little you still have room. I started thinking about marshmallows as candy and looking on the internet and saw that all you need is a mixer, a candy thermometer, a stove top and some ingredients you can get at any store. All we lacked was a candy thermometer. So sure enough under the tree there was a box with a candy thermometer. My wife looked at me like 'a candy thermometer?'" Well, after the shock wore off, they experimented with making marshmallows and found it was so much fun. Their first batch was the best they ever ate. They kept making more and giving them to their friends soon they realized. "Maybe there are a lot of people who would really love marshmallows." 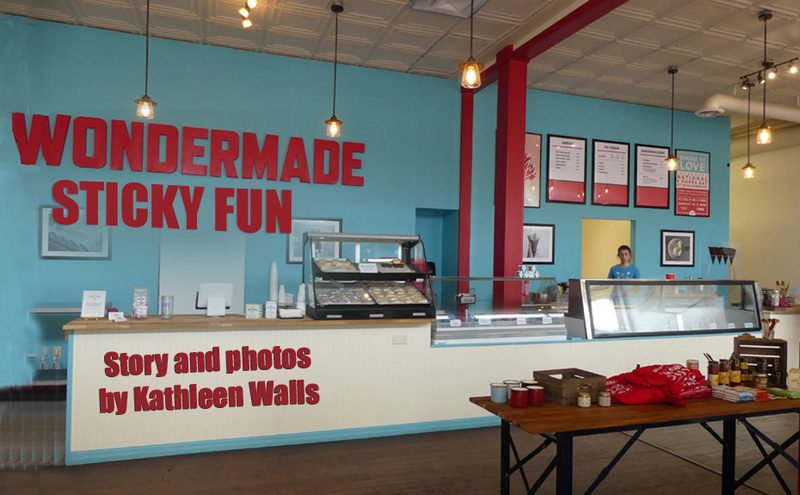 They opened first making just marshmallows but because they both love ice cream, they branched out. Today, Nathan said, "We make all your dreams come true mostly through marshmallows and ice cream. We are the biggest high-end marshmallow company in the entire world." We soon discovered there is more to Wondermade Marshmallows than those store-bought ones you dunk in hot chocolate or roast over a campfire. Think Bourbon Marshmallow or maybe a 24 carat gold marshmallow with champagne inside and topped with hand-engraved gold. 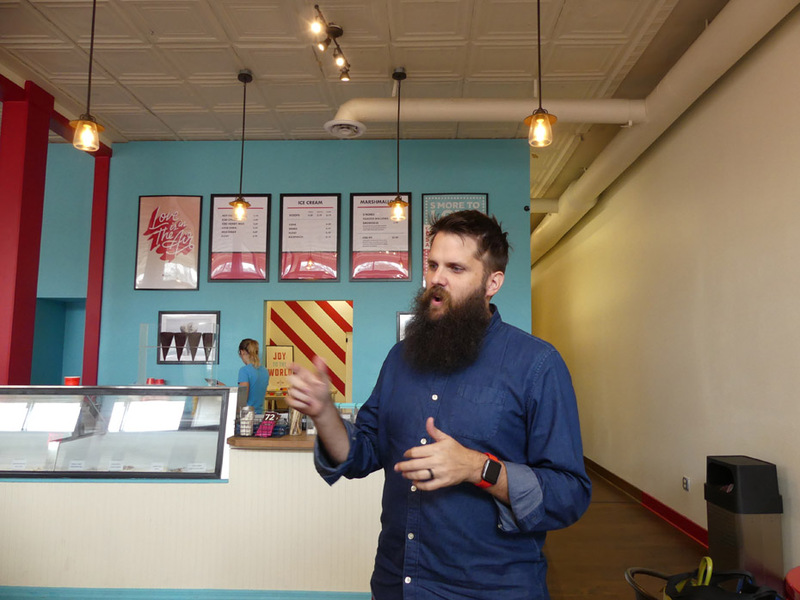 Their ice cream is equally creative with flavors like avocado or cornbread ice cream. When we visited we got to experiment with making some marshmallows of our own. Nathan gave us each a slab of our choice of marshmallow, powdered sugar, a batch of different shared cookie cutters, and some chocolate and varicolored chips. He confined that the secret to really fluffy marshmallow is the gelatin. Gelatin loves air and holds it in a great big hug. After a little instructions he turned us loose. What fun! I favored the small, star-shaped, vanilla flavored marshmallows covered with chocolate. Others favored an apple-cinnamon, larger, round one covered with varied colored chips. If you attend one of their events, you will have your own favorite combination of shape, flavor and toppings. I wondered how they became so well known and asked Nathan. His answer was simple but makes sense, "When you do a thing no one else is doing in a way that catches people notice and seems a little different people just want to tell other people. I tell the staff we're selling marshmallow and ice but what we're really selling is stories." They have never done any formal marketing but have sold all over the world, been written in hundreds of magazines, and sent marshmallows to people like Oprah and Martha Stewart.